Need more information about booking Home 8599782 ? Positioned only a few steps from the water's edge, serenity has been ideally set up for people wanting a beachside escape. You and your family would be able to recharge your batteries by swimming, snorkelling, fishing, kayaking and long beach walks or just enjoy the scenery and relax through the night and day. As you travel towards St. Leonards from Geelong you will discover its beauty, with its rolling hills, vineyards, olive groves, grazing cattle and ocean views in the distance. The area offers a wide range of activities including restaurants, cafe's and wineries nearby. lounge/dining room, kitchen area and front patio. The kitchen is fully equipped, including a fridge, freezer, microwave, toaster, slow cooker, cookware and an electric stove and oven. There is also an iron and ironing board, along with, cutlery, glassware, dining table and chairs and ample storage space. You will also find a vacuum cleaner in the kitchen pantry. Laundry facilities such as washing machine and dryer included. A split system and ceiling fan is located in the main living area. The split system can be used for both heating and cooling. 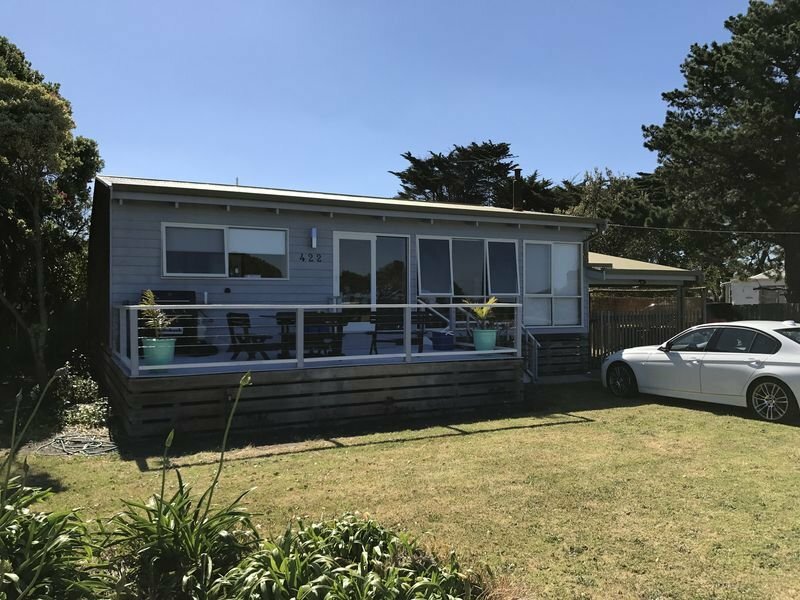 The beach house has a large deck in the front allowing you to enjoy the fantastic views whilst having a barbeque with your family and friends. The land around the property is rather spacious so the children could enjoy a game of footy or backyard cricket with their friends. Could safely store your boat or jetski behind the house. Fantastic sunset scenery on the back of the property, with a view over the salt lake could be enjoyed with a glass of wine. - NO parties - this is not a party house. - NO drug use / illicit substances. - NO pets unless prior arrangements are made with the Property Manager. - NO smoking inside the property - smoking is permitted ONLY in designated outdoor areas. Evidence of smoking inside the property will result in loss of bond. - Breach of any above rules will result in loss of bond and IMMEDIATE termination of accommodation. A full copy of the Tenant Agreement is available at the property. You can get in touch with Sascha (the owner) through the contact form on this page. Send Sascha (the owner) an email through the contact form on this page. Alternatively, if there’s a phone number on this page, you can call them. How do I contact Sascha (the owner)? If you’ve already booked, go to Manage your holiday booking to view Sascha the owner's contact details or send them a message. Or send Sascha (the owner) an enquiry through the Contact the owner/manager form if you’d like a quote or more info first. When you pay online through the Book your stay form, a booking request is sent to Sascha (the owner). You’ll find out within 24 hours whether they’ve accepted - no money will leave your account before then. You can also request a quote from Sascha (the owner) through the contact form. The owner will email you the total cost for your dates and a link to book and pay online. Use the Book your stay form to pay provisionally online. You can pay by credit/debit card or PayPal. Sascha (the owner) will have 24 hours to accept the booking and no money will leave your account before then. Why can't I call Sascha (the owner) before booking? You’ll need to contact Sascha (the owner) to do this. Send them a message in Manage your holiday booking or through the contact form on this page. You can request to change the dates or number of people on your booking via the Manage your holiday booking page. To change your holiday dates use the Edit booking button. If you need to change the number of guests staying then send Sascha (the owner) a message. If Sascha (the owner) agrees, they’ll send you a revised quote outlining the changes. You can review and accept/decline this from the Manage your holiday booking page. You’ll have 48 hours to take action before the revised quote expires. Estimated price per night based on a weekly stay. Owner fees of £33.00 per stay may apply. Enter your dates to see the total cost.